Here's more from Stephen Prothero's Religious Literacy, with my thoughts on some applications to Mormonism at the end. After glowing about the good 'ole days of the religiously literate 18th century — "Colonists did not just believe in the Bible, they knew what it said" — Prothero tries to explain what went wrong. A move from head to heart, from didactic sermons to revivalism of the sort practiced in Joseph Smith's New York, was the big step. Methodists and Baptists led the emotional charge that displaced the stodgier Congregationalists and Anglicans, but newer sects such as the Mormons also appeared in this new pluralistic religious landscape. So what is to be done? Prothero argues that public schools should re-assume the task of conveying basic knowledge about religion using a fact-based religious studies model (carefully avoiding a confessional or evangelical approach). He advocates two high school courses, one on the Bible and one on world religions. He reviews the legal context, opining that the US Supreme Court has always allowed teaching about religion while barring advocacy of particular religious beliefs or practices in public schools. He also notes how wary public schools are of anything having to do with religion, but emphasizes that hundreds of school districts manage to teach educational Bible courses without undue controversy. The Bible is, after all, the best-selling book in the world — how can schools that bracket the Bible from the curriculum claim to be giving a quality education to students or to be preparing them for college or even for citizenship? Alas, Huckabee isn't the only Evangelical who thinks Mormons worship both Jesus and Satan. [Not that I really think Huckabee believes that's what Mormons think, but that's a problem for a different post.] Just imagine what they think of Hindus or Muslims. Or even Catholics. Prothero quotes Mark Noll, author of The Scandal of the Evangelical Mind, who observed that "the scandal of the evangelical mind is that there is not much of an evangelical mind." Still, one must try. And what's the Mo app? First, we've avoided the lowest rungs on the ladder of religious ignorance: Mormon youth still learn the basics of LDS doctrine and don't have a hard time explaining, for example, how Mormons differ from Methodists or Baptists. Second, we ought to consider incorporating a basic knowledge of other denominations and religions into the LDS curriculum. I know BYU has electives that do this, but why not pull some of that material into Sunday School and seminary? Third, the sudden emergence of university-level Mormon Studies programs seems very much in line with Prothero's religious studies approach to reinvigorating the teaching of religion generally. Perhaps those programs will be a vehicle for change in the LDS curriculum. I doubt CES will move in that direction of its own accord, but if we really expect the rest of the world to know something about Mormonism, shouldn't we likewise make an officially sponsored effort to learn something about their beliefs? shouldn't we likewise make an officially sponsored effort to learn something about their beliefs? Preach My Gospel has a few lines on the Reformation and world religious leaders, with the caveat that it is "to be used only when needed." It appears that the issue you raise is making a faint blip on Salt Lake's radar screen. At the end of second quarter, my wife's seminary class filled out a questionaire on how they feel about what they are getting out of the class. One very diligent freshman wrote "More facts and less discussion." Looking over the responses in the evening, she remarked "Good luck with that, Jonah." What that boy wants is the opposite of the focus of church education. There's Elder Oaks "Good, Better, Best": "good to hold a meeting, better to teach a principle, but best to actually improve lives as a result of the meeting." In our ward conference, the ward Sunday school staff had some training from the stake Sunday school presidency. A teaching of Henry Eyring was shared that uses a pyramid metaphor: the tip should be the contents of the scriptures, the middle should be doctrines and principles, and the broad base should be application. It was said that incorrect gospel teaching does the opposite; it fills the time with lots of stories, and includes little consideration of how to live gospel teachings. My wife said this lesson from Pres. Eyring has been part of her seminary training as well. A few years back she was assigned to teach her Relief Society about studying the scriptures. Wondering what she could say on the topic that would matter, she started out with "The contents of the scriptures matter, and there is a lot in there that will never be discussed in a class at Church, so if you aren't studying the scriptures on your own, there will be important knowledge that you're missing and will never get any other way." She says that brought a number of nods of agreement from the scripture readers in the room. 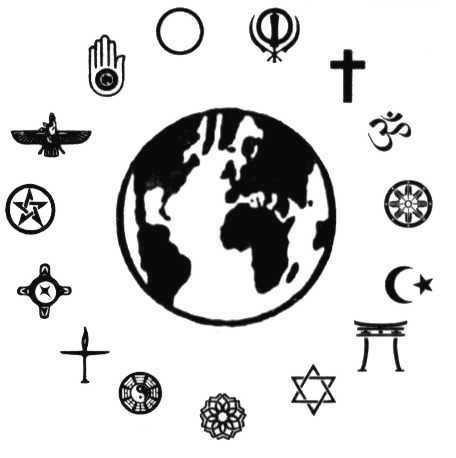 I think more than focusing on other religions beliefs, all people (LDS or not) should at least be familiar and respectful of the practices of other religions. OK... Except, Mormons actually DO tend to not just believe the Bible, but "know what it says." So I'm not sure why he thinks Mormonism is a good example of moving away from knowledge. Sounds like more of the same traditional Christian prejudice against Mormons as "emotional know-nothings." What he doesn't get is that, for all our emotionalism, we actually tend to know our stuff. More than people in his own congregation probably. The evangelical stereotype of Mormons as "all emotion and no knowledge" is frankly a load of crap. What happened to the Religions of the World CES manual? It seems to have disappeared. Just to clarify Seth, the religious literacy points are a summary of Prothero's longer and more articulate arguments in the book. The application to Mormonism is my own "liken unto us" exercise. I added a phrase in the first paragraph to make this clearer. Note that I did say (in the last paragraph): "Mormon youth still learn the basics of LDS doctrine and don't have a hard time explaining, for example, how Mormons differ from Methodists or Baptists." So I'm agreeing with you that Mormons do tend to learn the scriptural basics. While taking time during Sunday classes to study other religions is probably not going to happen, a little over the pulpit encouragement in that direction from the GA's and even the local leaders might go a long way. OK even I can't tell what I meant by that comment. I mean that some encouragement from our leaders to learn about other religions on our own time would be helpful for some. Sometimes our "one true church" rhetoric makes it seem that there is just no need to know too much about other religions. But if it were being mentioned as a good thing to do by stake leaders, etc. then it would be more likely that those who need that kind of sanction would make an effort. Does the writer talk about the lack of liturgy or decline of ritual in conjunction with the "dumbing down" of religion, so to speak? B Hodges, Prothero does refer to the effect of Vatican II on Catholic religious illiteracy, but it is more related to changes in youth education (no more memorizing the Baltimore Catechism, which I'd never heard of before) than changes in the liturgy or the ritual of the mass. The discussion portion of the book is only about 130 pages, followed by about 100 pages of the alphabetical dictionary treatment of key religious facts and concepts. It's an easy read if you happen to stumble across the book at the library (as I did). "Mormon youth still learn the basics of LDS doctrine and don't have a hard time explaining, for example, how Mormons differ from Methodists or Baptists." But frankly, most Baptists and Methodists I know can't explain the difference between Baptists and Methodists, or even different types of Baptists and Methodists. I've had students who loudly proclaimed to be Christian, yet couldn't tell me what the phrase "crown of thorns" in Charlotte Brontë's introduction to Jane Eyre referred to. Most Mormon kids in Jr. High could tell me that. We aren't perfect, but as Dave said, we've avoided the bottom rungs of the ladder. I heard the manual is being revised (though that's hearsay on my part), but I know that it's still available, and the local institue here in Austin uses it. Well, they just need to watch "A River Runs Through It" and Norman Maclain's Presbyterian minister father will teach them the difference between Methodists and Baptists. Ah, a quick library read ought to do it, then.